incredibly fed blog: Belacan Beware!!! Belacan Chicken Wings Incredibly Fed Style! Combine marinade ingredients in a large mixing bowl, mix well, add chicken pieces and ensure each is well coated. Transfer into an airtight container or sealed freezer bag and leave over night in the fridge. Next day mix three flours in a bowl with pepper. Drain each piece of chicken so that each is quite dry and dip into flour. Shake off excess flour and deep fry in hot oil until cooked through and golden brown (approximately 6 - 8 minutes). 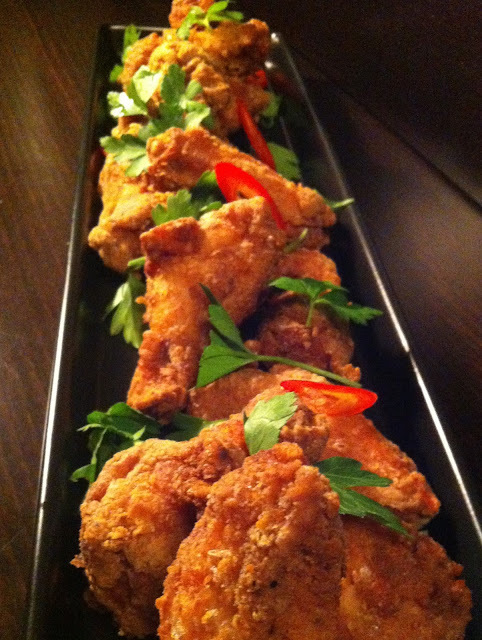 Drain the chicken on kitchen paper and serve with sweet chilli sauce or your favourite dip!